Photography has staked its claim as America's favorite hobby, and today, cameras are available in sizes and shapes to suit the needs of every kind of photographer and budget. Much like Henry Ford wanted a Model T in every driveway, George Eastman thought every consumer should be able to afford a camera. His developments in photographic film and portable, affordable cameras led to photo negatives from which prints can be made, color film, color positives or slides, pocket-sized cameras, and point-and-shoot cameras (including single-use or disposable cameras) known for their ease of operation. Photography has also branched into more complex directions with developments in the camera lens, the single-lens reflex (SLR) camera that allows the photographer to see through the viewfinder what the camera sees, state-of-the-art electronics, and an assortment of mechanical controls. From the simplest amateur camera to the most complex, professional piece of equipment, all cameras have five common parts. The lens is made of glass or plastic (or groups of glass elements) and focuses light passing through it on the film to reproduce an image. The diaphragm is an opening or aperture that controls the amount of light entering the camera from the lens and so limits the film's exposure to light. The diaphragm ranges in complexity from a fixed lens, opening in a simple camera, to apertures that can be adjusted manually or automatically. 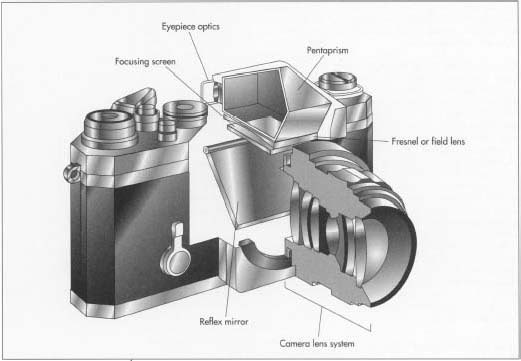 The three remaining parts common to all cameras are incorporated in the camera body (also called a chassis or housing). The shutter also limits the film's exposure to light by controlling the length of time the film is exposed. Shutter speed can be adjusted in many cameras to suit light conditions and the photographic subject matter; moving objects can be frozen on film with fast shutter speeds. The camera body encloses and protects the operating parts of the camera, including a light meter, the film transport system, built-in flash, the reflex viewing system, and electronic and mechanical components. The body must be lightproof, durable, and resistant to environmental changes. The viewfinder is a specialized lens the photographer uses to preview the photograph either through the lens, if the camera is a reflex-type, or in a separate view for simpler cameras. The story of the camera may have begun thousands of years ago when people first noticed that a chink in a wall or hole in a tent let light into the room and made a colored, upside-down reflection. The word camera means room, and the first camera was a room (or tent, actually) called a camera obscura with an eye at the top of the tent much like a periscope that could be rotated. Artists used it by training the eye on an image, which was reflected down onto the artist's work table where it could be drawn. Euclid and Aristotle studied the principles of light, and Leonardo da Vinci described and diagrammed the camera obscura, although it was not his discovery. The first portable cameras were boxes with lenses on the front over apertures and plates at the back. The plates were flat and covered with light-sensitive materials. By removing the cover over the lens, light entered the box and was focused by the lens on the rear plate. Early exposures took from several seconds to a number of minutes because the sensitivity of the plates was so poor. Also, the only image was the one on the plate; photos, like those produced by Louis Daguerre and Joseph Niepce in France during the 1820s and 1830s, were unique artworks that were not reproducible. Plate-type photography continued to be refined, and, as plates were made more sensitive to light, the lens was improved to provide a variable aperture to control light exposure. The camera was also modified by adding a shutter, so exposure time could be limited to seconds or less. The shutter was made of several metal leaves that opened or closed completely. A rubber bulb was used to provide air pressure to operate the shutter. The invention of roll film in 1889 by George Eastman made photography more portable because cameras (and their operators) did not need to carry cumbersome plates and chemicals. Eastman's invention and the cameras he also manufactured made photography a popular hobby. By 1896, the Eastman Kodak Company had sold 100,000 cameras. The camera was modified to include a film transport system with take-up spools, a winder, a lever for cocking the shutter, and shutter blinds. By the turn of the century, the major obstacles to taking photographs had been eliminated and, in the twentieth century, photographic history has branched from the basic concept and perfected each development. These developments are numerous, but include design and perfection of flash units including synchronized and high-speed flash; continued miniaturization of cameras; the Polaroid system of producing a finished print in the camera and without a negative; design of high quality equipment like Leica, Zeiss, and Hasselblad cameras and lenses; and advocacy of photography as an art form by photographers such as Matthew B. Brady, Alfred Stieglitz, Edward J. Steichen, and Ansel Adams. 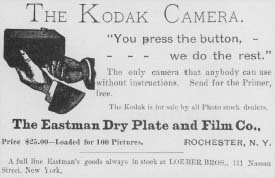 This Kodak Camera advertisement appeared in the first issue of The Photographic Herald and Amateur Sportsman, November, 1889. The solgan "You press the button, we do the rest" summed up George Eastman's ground-breaking snapshot camera system. George Eastman introduced his Kodak™ camera in 1888 and revolutionized popular photography. The Kodak camera was small, handheld, inexpensive, and, for the first time, made especially to hold a roll of flexible film. Prior to this, light sensitive chemicals captured the black-andwhite negative images on pieces of glass. Large cameras were used to hold the photographic plates and a tripod was needed for support. For ordinary Americans, photography consisted of posed portraits in a professional photographer's studio. The Kodak camera allowed the average person to take photographs of their families, their homes, and their surroundings. It inaugurated the snapshot era of do-it-yourself photography. Awarded a medal at the Photographers' Annual Convention as the photographic invention of 1888, thousands of $25.00 Kodak cameras sold during the first year. By 1889, celluloid, a type of plastic, replaced the paper of the first flexible film base. Another unique feature for the time was that the amateur photographer returned the unopened camera to the Rochester, New York, factory. There the film negatives were processed and the 2.5 in (6.35 cm) circular images were printed on paper and mounted on cardboard. The camera was then re-loaded with an unexposed roll of flexible film and returned to the customer with the processed photographs and negatives. This cost $10.00 and produced 100 snapshots. This activity became so popular that the term kodaking soon meant a fun outing to take snapshots. Camera design is an intricate and specialized field. All designs begin with conceptualizing a product and evaluating the potential market and the needs of the consumer for the proposed product. Designs begin at computer-aided design (CAD) work stations, where the product's configuration and workings are drawn. The designer selects the materials, mechanics, electronics, and other features of design and construction, including interfaces with lenses, flash units, and other accessories. The computer design is also tested by computer simulation. Designs that pass the computer program's review are checked against the initial concept and marketing and performance goals. The camera may then be approved for production as a prototype. Manufacture of a prototype is needed to test actual performance and to prepare for mass production. The prototype is tested by a rigorous series of field and laboratory tests. Prototypes selected for manufacture are used by the engineers to prepare design details, specifications, and toolmaking and manufacturing processes. Many of these are adapted directly from the CAD designs by computer-aided manufacturing (CAM) systems. Additional design is needed for any systems or accessories that interface with the new product. Camera manufacturers can conceive a new product and have it ready for shipment in approximately a year by using CAD/CAM design methods. 1 The camera chassis or body and back cover are made of a polycarbonate compound, containing 10-20% glass fiber. This material is very durable, lightweight, and shock-resistant as well as tolerant to humidity and temperature changes. Its major disadvantage is that it is not resistant to chemicals. The polycarbonate is molded to very specific tolerances because the internal workings of the camera must fit precisely to work well and to use the strength of the chassis for protection against jarring and other shocks, to which mechanical and electronic parts are sensitive. After the chassis is molded and assembled, it becomes the frame to which other parts of the camera, like electrical connections in the battery housing and the auto focus module, are attached. 2 The shutter assembly and film transport system are manufactured on a separate assembly line. These parts are largely mechanical although the film transport system has electronics to read the speed of the film. DX film coding appears as silver bands on the roll of film, and these are detected by multiple contacts in the film chamber. More advanced cameras have microchips that see the data imprinted in the silver bands and adjust shutter speed, flash, and other camera actions. Again, all parts are precisely made; the film magazine size must be accurate to 60 thousandths of an inch. 3 The shutter functions like a curtain that opens and closes. It must operate exactly to expose the film for the correct length of time and to coordinate with other operations such as the flash. The shutter is made of different materials depending on the type of camera and manufacturer. 4 The viewfinder lens is a specialized lens that is manufactured using the same methods as a camera lens. The viewfinder also is made of optical glass, plastic, or glass/plastic combinations. All but the simplest viewfinders contain reticles that illuminate a frame and other information on the eyelens to help the photographer frame the picture. An in-line mirror has specialized coatings for color splitting; as many as 17 coatings may be added to the mirror to correct and modify its reflective properties. Single-lens reflex (SLR) cameras have through-the-lens viewing capabilities and are also called real image viewfinders because they let the photographer see as the lens sees. The SLR viewfinder uses a prism to bend the light from the lens to the photographer's eye, and the prism is made of optical glass to precise requirements to make the correct view possible. as subassemblies for the electronic brains of the camera and attached flash, if any. Quality assurance and quality control practices are a matter of course among camera manufacturers. All departments from manufacturing to shipping have their own quality assurance procedures, and companywide quality assurance is also overseen by a separate division or department. The overseeing quality assurance divisions use statistical methods to monitor aspects of product quality such as camera function, performance, consistency, and precision. They also guide the flow of one assembly system into another and provide corrective measures if problems arise. No byproducts result from camera manufacture, but a number of wastes are produced. The wastes include resins, oils such as cutting oil, solvents used for cleaning parts, and metals including iron, aluminum, and brass. The metals and resins are remainders or cuttings from manufactured parts and powder-fine cuttings and dust. The wastes are sorted by type and recovered; they are recycled or treated as industrial wastes by firms specializing in these activities. Camera manufacturers are well aware of the hazards associated with their processes and are careful to observe environmental regulations and sensitivities both in the country of manufacture and in receiving marketplaces. Japan's camera industry stopped using chlorofluorocarbons and trichloroethanes to clean printed circuit boards and camera lenses in 1993 on instruction of Japan's Ministry of International Trade and Industry (MITI), in response to import conditions of other countries, and in acknowledgment of industry-wide respect of the environment. For cameras like many other technical products, the future is electronic. The digital still camera introduced in 1995 stores approximately 100 pictures electronically. Instead of a viewfinder or eyepiece, the camera has a color LCD screen similar to the view-type screen on some video cameras, so photos can be viewed instantly. It can be connected by cables to a computer, television, or VCR, so pictures can be transferred to screen, tape, or digitized electronically. The digital camera has another advantage; after taking a photo and reviewing it, the photo can be erased if the photographer does not like the result. There is no wasted film or wasted space in the digital storage process. Also, the photograph can be edited, cropped, or enlarged as it is being taken. After photos have been taken, they remain in the camera as digital files rather than as negatives. To take more photos, these images have to be removed, and they can be stored on a computer disk. All the photos can be moved as a batch, or they can be stored on the computer one-by-one, or deleted from both the camera and computer storage. The transfer process requires software that also allows text to be attached to each picture to date it or write a caption. The camera or computer containing the photos can be hooked up to a video printer to print out copies on paper, or the photos can be transferred to videotape for viewing. Bailey, Adrian, and Adrian Holloway. The Book Of Color Photography. Alfred A. Knopf, 1979. Collins, Douglas. The Story of Kodak. Harry N. Abrams, Inc., 1990. Sussman, Aaron. The Amateur Photographer's Handbook. Thomas Y. Crowell Company, 1973. Antonoff, Michael. "Digital Snapshots from my Vacation." Popular Science, June 1995, pp. 72-76. From Glass Plates to Digital Images, Eastman Kodak Company, 1994.